You can have that sought-after spa glow right at home. Imagine the perfect spa day: solo pamper time, dim lights, soft music, and lotions and potions so rich and luxurious, they make you feel like a million bucks. We all love a spa day where we can sit back and focus on ourselves but sometimes, our busy schedules don't give us too many options. Instead of fretting about never getting your spa day, turn the tables around and create your own spa-like experience at home. You don’t have to take more than a few steps to achieve the same, lush, relaxing experience you look for at a fancy spa. All you need is to set the mood, get the right products, and learn how to treat yourself with utmost TLC. 1. Set the pace for your beauty rituals. Replicating the vibe of a spa is all about ambience. Get the mood going by dimming the lights, lighting some candles, or playing some relaxing jazz music. Imagine getting the long-overdue relaxing shower you deserve amidst all these. Now that's what you call living the life. If you do your research well, you’ll find that you don’t have to spend an arm and a leg to get good quality beauty products that deliver the same zing as the elixirs you’ll find at a spa. 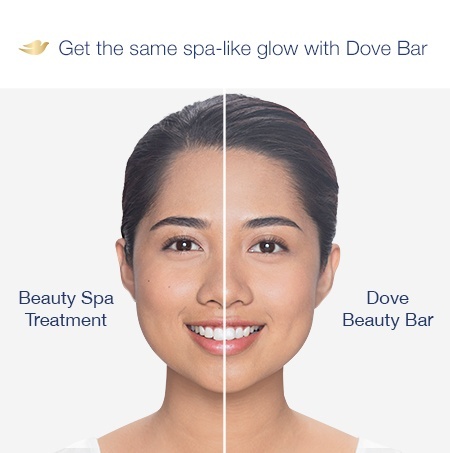 Dove Beauty Bar, for example, can help you achieve that spa-like glow without having to leave the comforts of your home. For under P50, you can reduce a P1000 facial at a spa to a good at-home cleanse and moisture routine. It’s all a matter of looking for products that are aimed to enrich and enliven, and you’ll secure that special glow that spells ultimate relaxation. Pampering your skin means giving it the moisture it needs. You don’t need a slew of serums or oils to rehydrate your skin. Fill your beauty cabinet with products that pack in moisture even as it cleans. With the proper products, a one-hour long facial can be reduced to one easy one-minute step. With an at-home spa treatment, you don’t have to limit yourself to “just” a facial or “just” a good hand massage. Use products that do your body good from head to toe so you exude that fresh-from-the-spa smoothness all over.